restoration systems to the body. With adhesive coated on both sides, they provide a comfortable, air-tight seal that conforms to the irregular contours of the stoma and eliminate hissing a side effect often found in other thinner or less flexible products. • Closed-Cell Foam Structure—for an air-tight seal that eliminates hissing. • Perspiration resistant—It retains it's adhesive qualities even when sweating. 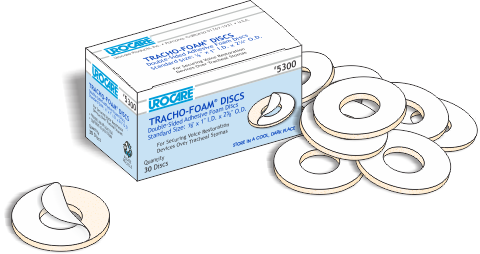 If the disc is difficult to remove, Urocare® Adhesive Remover Pads may be used to soften the adhesive and assist in the removal of the disc. They contain a non-toxic, citrus-based adhesive remover that may also be used to remove most types of medical adhesive or adhesive residue from skin and appliances or in preparation for use of a new disc. Most medical grade adhesive removers will work basically in the same manner; however, consult your doctor or speech therapist to decide the best product for you and how to use it safely. For more information—see Urocare® Adhsive Remover Pads. In the event of skin that has become sensitive to aggressive medical adhesives, Urocare® has developed Uro-Prep® a protective skin barrier wipe for used under all types of medical adhesives. They protect delicate, sensitive skin from aggressive adhesives often used in conjunction with urinary or ostomy appliances. Uro-Prep® wipes are safe, effective, and for external use only. For more information—see Uro-Prep®.